Let’s face it; one of the most difficult things to do in today’s “Digital Age” is focus. Unregulated distractions, email, news, text messages, social media…the list goes on, are constantly nagging at your time and your trading day. The answer was simple and to the point. It inhibits his ability to focus. Despite the ridicule he receives, he chooses not to invite that distraction into his work. In fact, I thought immediately to my own technology gadget purchases that didn’t exactly make life easier. Every once and a while, I get this same type of trepidation from my clients when it comes to switching from a single monitor to a multiple monitor setup. The question always seems to be the same…is it a distraction or a focus booster? From my experience, multi-monitors add a tremendous amount of ability and focus to my trading. It’s worth your investment to upgrade to multiple monitors. Are Single Monitors As Outdated As Dialup? Remember what it was like to use dial-up? Slooowwwww. Today’s Internet speeds offered through cable or fiber are exponentially faster and deliver a clear advantage. Using a single monitor is the equivalent of still having a dial up connection. It’s slow and super inefficient. When I only had one screen I was always having to toggle through all my charts and waste a huge amount of time navigating open screens and applications. As traders, the quote “time is money” holds very true. Wasting time leaves money on the table. This means lost executions. Now with multi-monitors, I am able to have all my trades open at once and can monitor them without having to open or close any windows. Want to turbo boost your trades and make more money? Of course, most traders would. No brainer, right? Multiple monitors is the ticket. My friend with the flip phone has a valid point. Technology should add to your life more than it subtracts (or distracts). Multiple monitors offer us traders several advantages. The most valuable advantage being the ability to focus in on several trades at once. Allowing traders to make more profitable trades. Utilizing multiple screens allows me to view my open trades with out missing a beat. I don’t have to close any screens to view a different chart. This means that I can see all the action and always be able to view any moves that are happening. This is not only valuable…to me it’s priceless. There has been more than one occasion that I was able to quickly exit a trade that suddenly took a downturn. Imagine the difference if that screen was minimized and I wasn’t able to catch that move right away. Look. I get it. Your screen setup works for you. 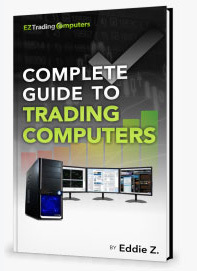 You’re trading profitably on a single monitor. Nothing is broken. Everything is working fine. Why mess with it? Adding one or multiple screens to your setup doubles or triples your screen real estate! No more distractions or time wasted toggling through open screens. If you have to multi-task. This is the best way to do it. Never miss a great trade. Multiple monitors allows you to view all your trades at once.